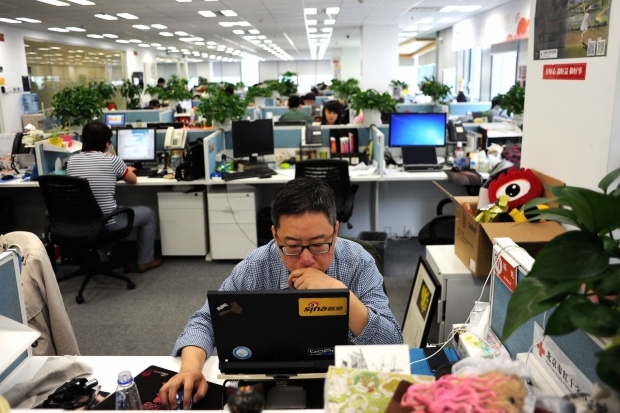 A man uses a laptop at an office of Sina Weibo, widely known as China’s version of Twitter, in Beijing on April 16, 2014. Observers have long thought that Chinese authorities censor the media depending on type: the censorship of traditional media is primarily conducted in advance, with a thorough inspection of news and discussion before publication; new media, in contrast, is primarily censored or penalized after the fact, in a “relatively mild” fashion. This observation appears less and less valid. China’s censorship of new media in fact extends from start to finish. For instance, personal posts that are put up on some major new media platforms (in order to recruit more users, Internet companies frequently offer personal media (zimeiti) hosting on their new media platforms) must first undergo inspection before being posted. On other personal media platforms where posts can be privately uploaded, if a post contains sensitive terms a warning will appear that says, “This is being sent for manual inspection,” and the author has no way of knowing if certain words will be found to be too “sensitive.” Whether or not the piece will pass inspection is a matter of luck. These new media platforms frequently put up prominent warnings that users of personal media must carefully read the platform’s rules of use or their accounts may be permanently shut down and offending texts may be deleted. User agreements on new media platforms stipulate that if the country’s laws are violated, the platform has the right to temporarily halt the user’s distribution of disallowed content, and to stop the use of the account or even shut it down completely. Exactly which regulation or law has been violated, however, is never expressly stated to the user. This, along with the requirement that users of personal media register using their real names, has had a general chilling effect on personal media. Pre-publication censorship and post-publication punishment have knit a large oppressive net around free speech. The King of Hell decrees that you won’t live through five more nights. His underlings say they’ll kill you after four nights so as not to be late. The goblins say they must closely implement the King’s wishes, so they’ll drop the ax on the third night. The guard to Hell says he’ll just kill you on the second night, since he can’t stand it when the bosses complain. We know that pre-publication censorship has a terribly oppressive effect on open discussion and the freedom to publish, and that it has long been rejected by countries governed by the rule of law. In China, however, a system of pre-publication censorship has always existed, in which, for instance, any publication must receive official permission before it can be publically distributed. When new media was just starting to appear, many people hoped that the existing heavy censorship could be broken with the power of the new technology. Up to this point, however, the authorities have only increasingly shifted their traditional methods of management onto the new forms of media, and the supervision has tended toward more interdependence and centralization, as the new media’s self-censorship and pre-publication censorship have grown stricter. Compared to post-publication punishment, pre-publication is even more obstructive to discussion. Whenever people stifle the topicality and timeliness of their discussions, the entire society suffers. A decision out of the Federal Constitutional Court of Germany states: “Pre-publication censorship and the existence of a system of inspection and approval are sufficient to produce a state of spiritual paralysis.” Unfortunately, it appears that the Chinese people will continue to be spiritually paralyzed for a long time to come.